Available in Field Mushroom and Smoked Tomato flavours. Very high carbohydrate meal to assist in carbohydrate loading prior to large endurance efforts. 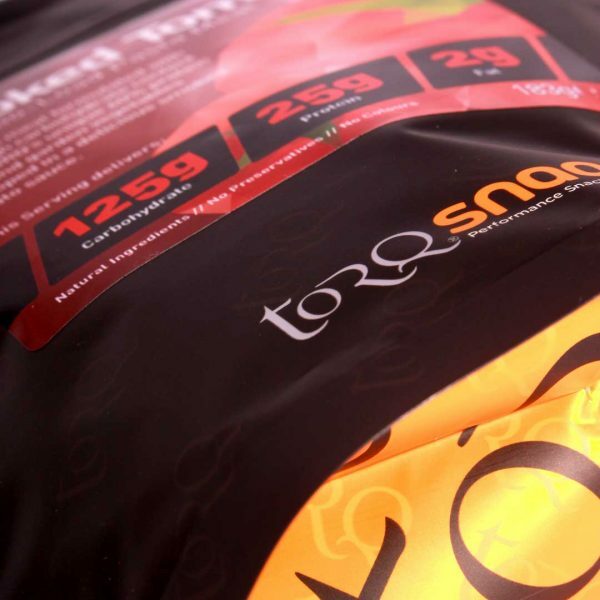 TORQ’s 5:1 Carbo-Load SNAQ Meals have been developed alongside our long-standing Performance Nutrition range. Formulated to deliver substantial quantities of carbohydrate (125g) along with a significant 25g serving of high quality protein, our 5:1 SNAQ Meals offer a comprehensive nutritional intervention to enhance glycogen storage before long endurance rides, between heavy training sessions or as a final meal before a big event. As well as providing a rich carbohydrate content, our 5:1 SNAQ Meals deliver all the essential amino acids necessary to promote a positive net protein balance to ensure protein supply outweighs breakdown, which is essential for muscle maintenance and recovery. Our 5:1 Carbo-Load SNAQ Meals can be enjoyed at any time of day in the run up to a hard training session or event. Simply add contents of the pack to 450ml of boiling water and cook for 10 minutes either on the hob or in the microwave. Garnish your 5:1 SNAQ Meal, with a vegetable side to ensure a complete meal balanced with carbohydrate, protein, fat, vitamins, minerals and dietary fibre to support a healthy, athletic lifestyle. We recommends that you allow approximately 3 hours after consuming this meal before commencing exercise, to allow for complete digestion. Most carbohydrate-loading regimens would suggest consuming this 5:1 meal as a final nutritional intake the night before your event/heavy exercise bout, but if exercising later in the day, you should continue carbohydrate loading to within 3 hours of when you are scheduled to start. 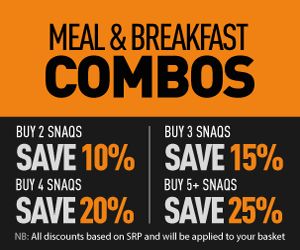 This 5:1 SNAQ Meal can also be used in conjunction with our TORQ Recovery Drink and 3:1 Recovery SNAQ Meal at times of particularly high training load, as it provides a higher dose of carbohydrate to assist further with the recovery process. It is well established that loading with carbohydrate prior to endurance exercise can be advantageous to performance by ensuring muscle glycogen stores are fully replenished. Modern carbohydrate loading protocols have concluded that full glycogen replenishment can occur in as little as 24 hours when 10g per kg of bodyweight of carbohydrate is consumed. For a 70kg person for instance, this equates to 700g of carbohydrate – quite a lot of carbohydrate! 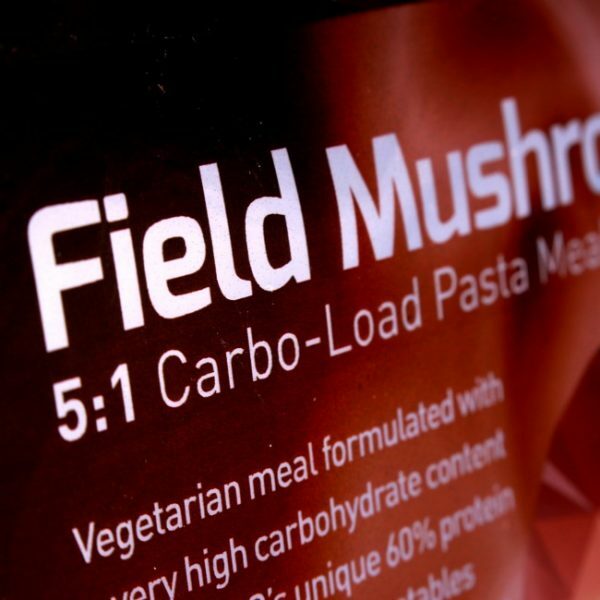 Our 5:1 Carbo-Load SNAQ Meal offers 125g of carbohydrate, providing a notable percentage of the daily carbohydrate calories required for complete glycogen replenishment. 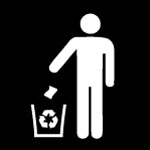 Our 5:1 SNAQ Meal is also very low in fat ensuring that excess ‘irrelevant’ calories aren’t consumed during this process. Combine a couple of TORQ’s 5:1 SNAQ Meals with a variety of other high carbohydrate, low fat food and drink sources in the lead up to your event/heavy exercise bout. 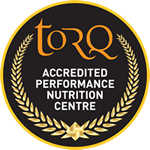 Also consider snacking on TORQ SNAQ Bars or adding TORQ Energy Organic to foods and drinks or make it into its own neutral drink to assist in the carbohydrate loading process. Consuming a carbohydrate rich meal in the 3-4 hours leading up to an event can continue to restore glycogen across the body’s storage sites. Carbohydrate storage is saturated at 500g, with around 400g stored within skeletal muscle and around 100g stored within the liver, so a carbohydrate rich meal should be considered a few hours prior to the start of your event/heavy exercise bout where possible (liver glycogen stores can become depleted after an overnight fast). Alternatively, consuming a 5:1 SNAQ Meal prior to going to sleep is standard practice for events starting very early the next morning. Consuming rich, lean sources of protein can enhance training adaptation by ensuing there is sufficient availability of free circulating proteins required for muscular and cellular repair and reconstruction by stimulating muscle protein synthesis factors. 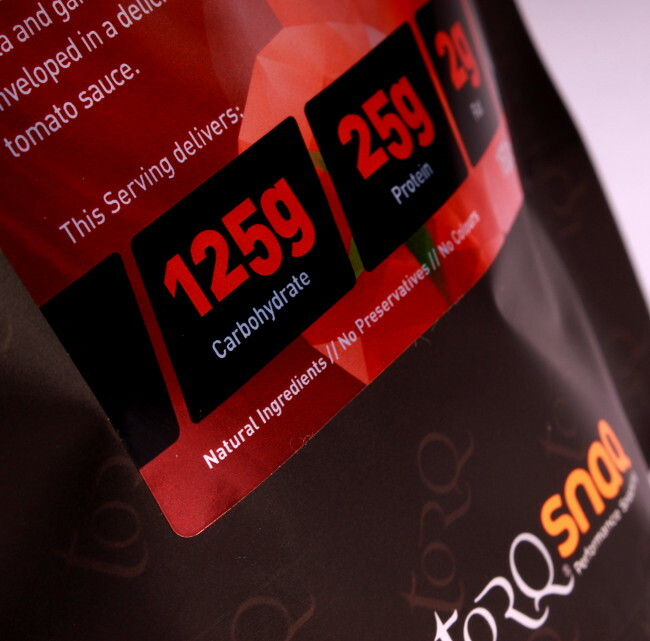 Our 5:1 SNAQ Meals also contain 25g of premium quality vegetarian protein with an extensive amino acid range. 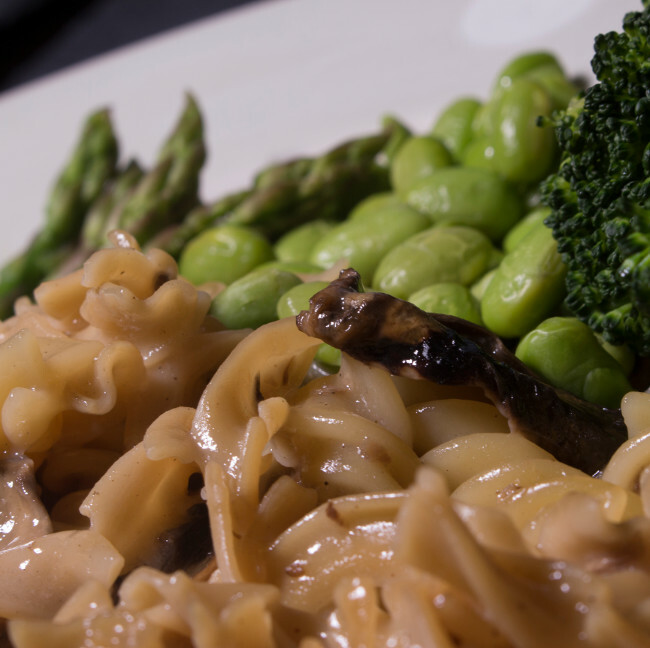 The protein is delivered primarily from our unique and highly functional TORQ Protein Fusilli (available separately) ensuring an extremely low fat source of the highest quality protein. 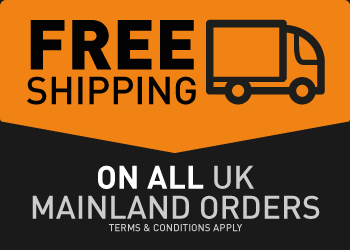 The extremely low fat content of these meals ensures that both carbohydrate and protein are delivered quickly and efficiently to the blood, optimising the supply of ‘useful’ calories.  This means that our meals contain fewer overall calories than would typically be consumed if creating your own recipes, because of the prevalence of fat in many commercially available protein sources and food ingredients in general. Our SNAQ Meals are deliberately low in fat to facilitate the rapid absorption of useful calories and we make a point of suggesting that you should accompany your SNAQ Meal with a fresh salad, broccoli, green beans or other fibrous vitamin-rich vegetables. Our meals can be consumed on their own without accompaniment and will be highly functional, but we would always recommend regular consumption of fresh fruit and vegetables, because the fibre and micronutrients contained within these fresh foods are essential for a healthy balanced diet. 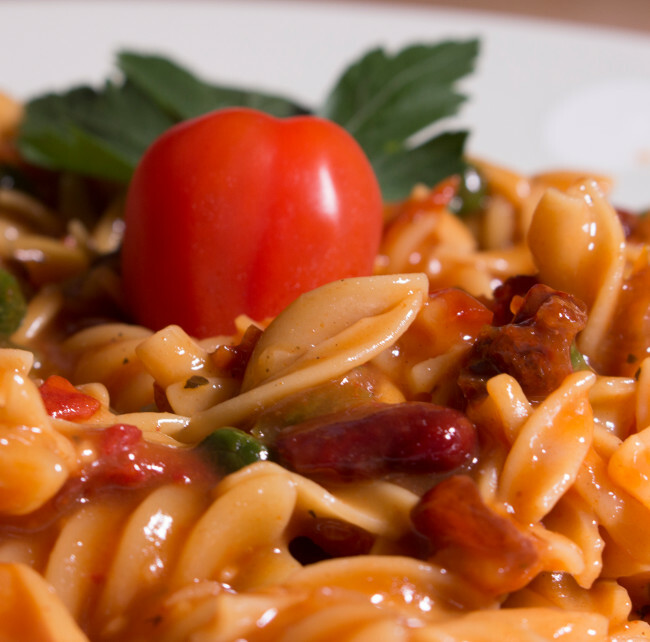 Ingredients: Fusilli (Durum Wheat Semolina, Water) (30%), Smoked Tomato Sauce (Maize Starch, Dehydrated Tomato, Sugar, Red Kidney Beans, Sun-dried Tomato, Tomato Flakes, Dehydrated Onion, Wheat Flour (Wheat Flour, Calcium Carbonate, Niacin, Iron, Thiamine), Milk Solids, Skimmed Milk Powder, Green & Red Bell Pepper, Rapeseed Oil, Dehydrated Garlic, Smoked Paprika, Basil, Black Pepper, Cumin, Ginger, Thyme) (26%), Protein Fusilli (Vegetable Proteins (Soya, Pea), Durum Wheat Semolina, Egg White Powder, Algae Extracts (Sodium Alginate), Amino Acids (L-Methionine, LThreonine)) (21.8%), Maltodextrin (14.2%), Dehydrated Garden Peas (4%), Sun-dried Tomato (Sun-dried Tomato, Salt) (4%). 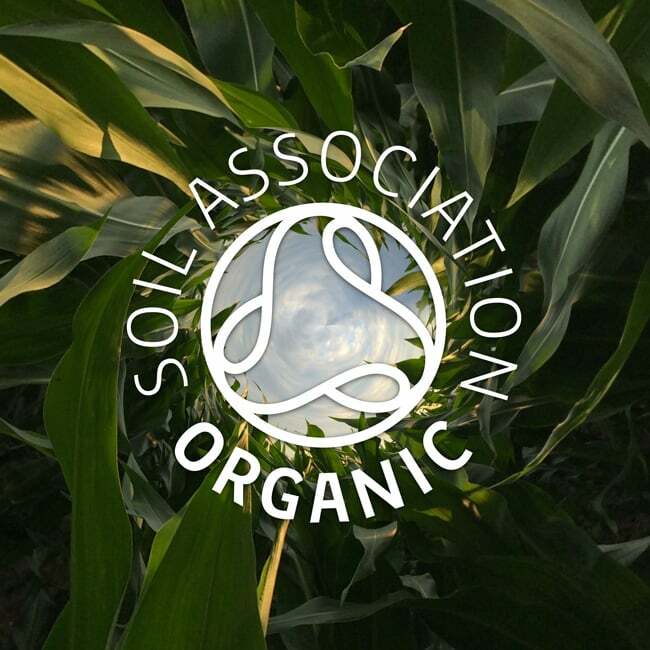 Ingredients: Fusilli (Durum Wheat Semolina, Water) (32.7%), Maltodextrin (22%), Protein Fusilli (Vegetable Proteins (Soya, Pea), Durum Wheat Semolina, Egg White Powder, Algae Extracts (Sodium Alginate), Amino Acids (L-Methionine, L-Threonine)) (21.3%), Field Mushroom Sauce (Skimmed Milk Powder (Skimmed Milk Solids, Vegetable Oil (Palm Oil and Palm Stearin), Sugar, Emulsifier: Soya Lecithin), Wheat Flour (Wheat Flour, Calcium Carbonate, Niacin, Iron, Thiamin), Maize Starch, Dehydrated Champignon Mushrooms, Yeast Extract, Natural Flavouring (Soya, Maize, Wheat), Dehydrated Onion, Palm Oil Fractions, Black Pepper) (16.3%), Dehydrated Mushrooms (4%), Garden peas (3.7%). 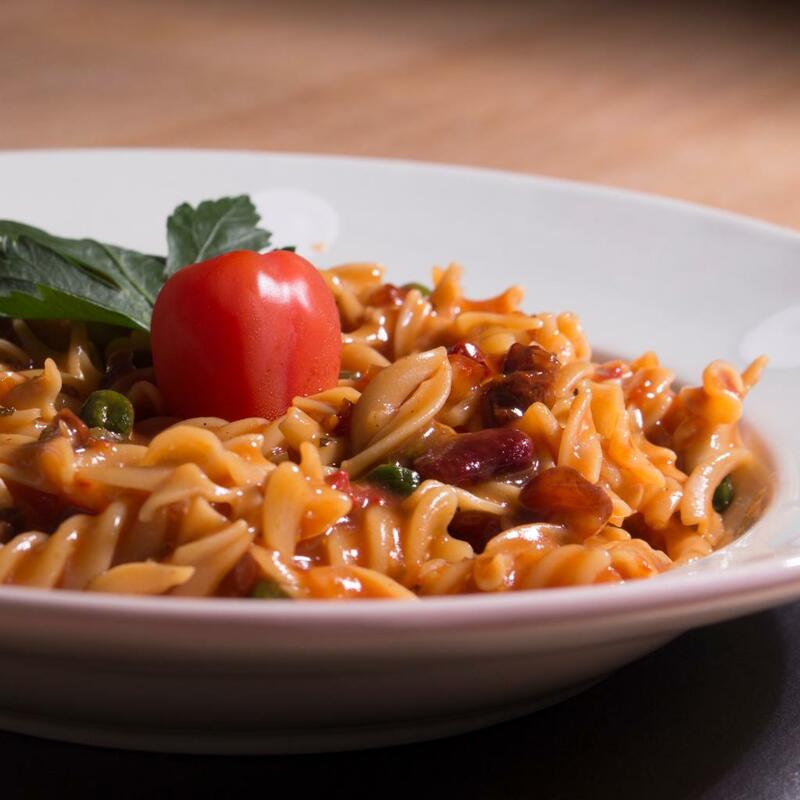 TORQ 5:1 Carbo-Load SNAQ meals contain TORQ 60% Protein Fusilli Pasta with an exceptionally rich Amino Acid profile.